LEADING hybrid rice producer SL Agritech Corporation (SLAC) has rebranded its products under the Doña Maria brand with the tagline “More than just rice” to highlight its goal of providing premium quality rice to consumers while also giving back to the community. SLAC Marketing Manager Isa Amarra told The Manila Times that Doña Maria aims to “enhance a sustainable quality of life and advocate a healthier future” among its Filipino consumers, noting that it is the only brand meticulously prepared and produced by SLAC from hybridization, planting, harvesting, milling and packing all the way to distribution. Amarra added that Doña Maria helps generate income for thousands of families of Filipino farmers who grow and harvest this hybrid rice through its contract growing program. “Doña Maria is more than just rice because it is of superior quality. We are proudly the first and only company that has a fully-integrated system from research and development of hybrid rice seeds to planting, harvesting, milling, packing and distribution. With this structure, we are assured of the superior quality of the rice that we distribute,” Amarra said in an interview. She said the rebranding included modification particularly of the brand’s logo and packaging to capture a bigger market share in the country. “We enhanced our logo to appeal to a broader market. 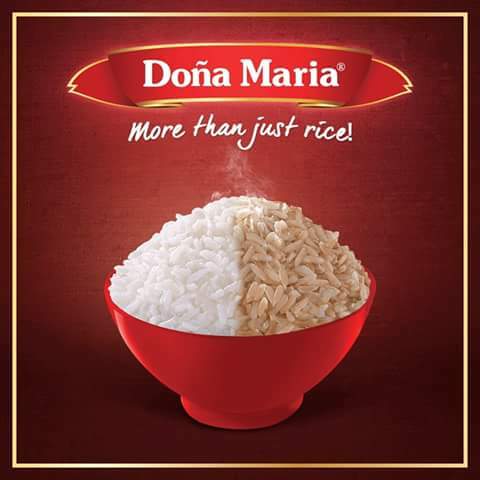 We added the color red in our logo to symbolize celebration and happiness as Dona Maria Rice is always at the center of every Filipino celebration,”Amarra said. “Also, since Doña Maria is being exported to 11 different countries around the world, we made sure that the cooking instructions were translated into English, French, Arabic and Chinese,” she added. She said the plan to rebrand Doña Maria was decided upon early this year. “It has been in the pipeline for a couple of months now because as a market leader and trendsetter, we always aim to be a catalyst of change and innovation leader in the category,” she said. The rebranded Doña Maria rice products are now available in select groceries and supermarkets across Metro Manila, Amarra said. Through hybrid rice technology, Doña Maria developed two new rice varieties, Jasponica and Miponica. Jasponica is said to be popular for its soft and fragrant features while Miponica is an alternative for sticky rice and is ideal for kakanin (rice cakes) and other desserts. SLAC is the only Philippine producer of SL-8H hybrid rice seeds with fully integrated operations, claiming to have 70 percent market share of the hybrid variety in the country. It offers rice, hybrid rice seed, agri-chem, and corn products.